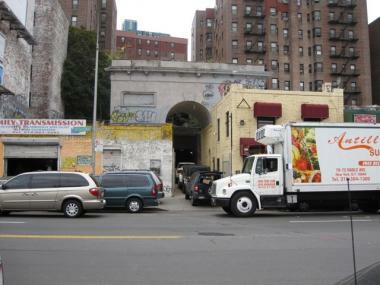 The Seaman-Drake Arch sits on a busy commercial strip on Broadway near W. 215th Street in Inwood. The arch is up for rent. Could it become a nightclub? INWOOD — For rent: A 150-year-old marble arch that once served as a gateway to the estate of one of Manhattan's oldest families. Heavy renovations needed. Tucked behind an auto-transmission shop and a grocery store on Upper Broadway, the Seaman-Drake arch is overrun with weeds, litter and graffiti. But step over the empty paint cans and rotting wood planks, past the remnants of a gatekeeper’s quarters, and it's possible to imagine what the scaled replica of the Arc de Triomphe that welcomed visitors to the mid-19th century hilltop estate owned by the Seaman family was like in its heyday. Or, if you’re real estate broker Andrew Shell, who is seeking new tenants for the arch and adjacent buildings, you see a sky-lighted nightclub and a rooftop café. 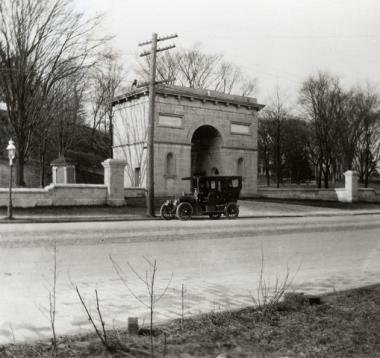 The Seaman-Drake Arch, at the former entrance to the Seaman residence, at Broadway and 215th Street, in 1910. “It’s a hidden treasure,” Shell said, standing atop a 1950s-era garage behind the arch, its curved cream-colored marble framing the elevated tracks of the 1-train across the street. The arch, built with marble from a nearby quarry, is the only structure left from the estate, which was built in the 1855 by John and Valentine Seaman. According to local lore, the extravagant replication of the Parisian icon earned the estate the nickname "Seaman's folly." In the 1930s, development overtook Inwood, surrounding the arch with apartment buildings, light industry and small shops. The marble is cracking in some areas, water-stained in others. Weeds and small trees peek over the roof’s edge. The ceiling of the north-side gatekeeper’s quarters is gone. The south side is being used as storage by the transmission shop. The arch has not been designated a historic landmark, which, depending on the point of view, is either a good or bad. Local history buffs would like to see it protected. But Shell says the owner, Salvatore Mantione, who inherited the property from his father, doesn’t want any additional hindrances on the property’s redevelopment. He’s asking $17,000 a month for the arch, the garage and adjoining retail space formerly occupied by a child-modeling agency. The complex totals about 7,000 square feet. Mantione has told Shell that his father received the arch as a gift from a man whose life he’d saved in World War II. Because of that, he does not want to sell the property. Mantione declined, through Shell, to be interviewed. 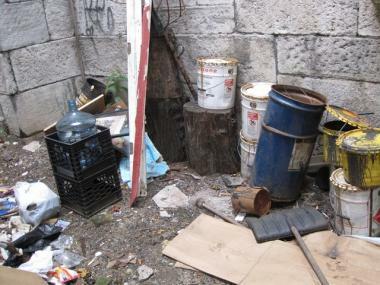 Trash has accumulated inside the gatekeeper's quarters of the Seaman-Drake Arch. Shell says he is entertaining offers from at least two potential tenants, one of whom would like to turn the complex into a nightclub. 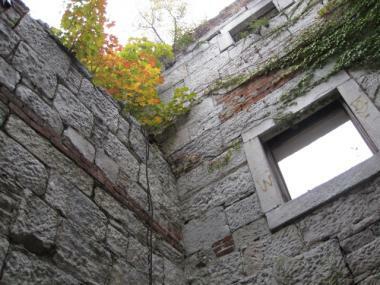 Weeds and small trees have sprouted from the roof of the Seaman-Drake Arch, Oct. 13, 2009.